This video shows how to use the Switch-Works to lay tie plates. 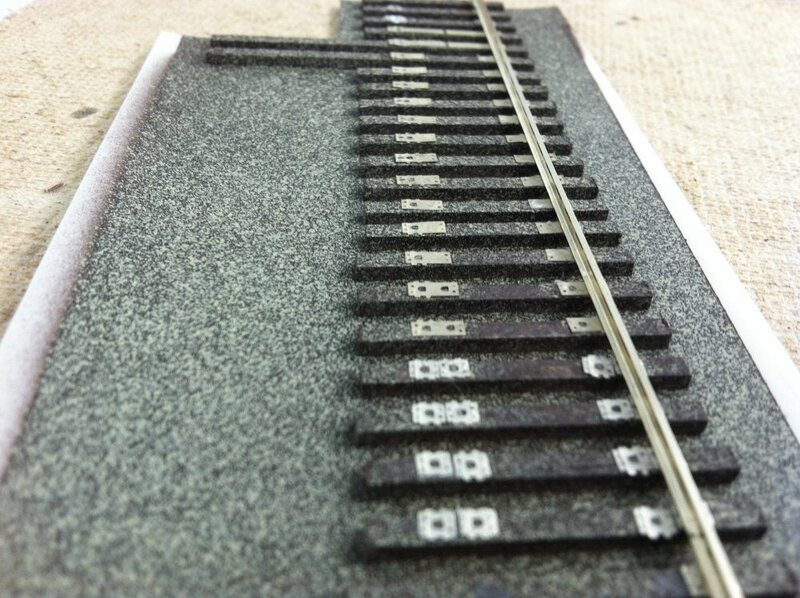 Switch-Works is a set of jigs for assembling “Museum Standard” track featuring wooden ties, metal tie plates, etched frogs and machined points. As part of the 4th Div. PNR NMRA Spring Meet, Andy Reichert’s Proto:87 Stores was kind enough to lend us some of the Switch-Works tools and provide us with kits for a clinic on how to build the “Ultimate Turnout”. Over the next couple of weeks I’ll be doing some clinic preparation and as a special thanks to Andy I wanted to put out some videos to help promote Proto:87 Stores products. 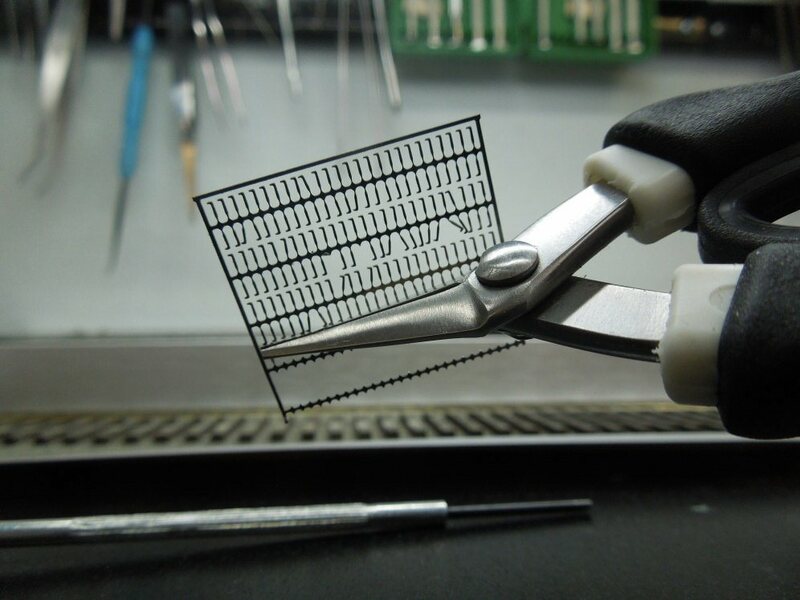 This video focuses on the etched metal tie plates that come with the “Ultimate” turnout kits. 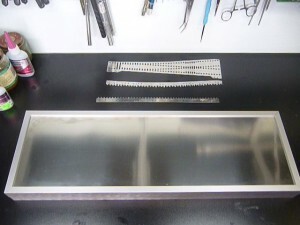 It explains what the tie plates are and how to cut them.. Switch-Works is a set of jigs for assembling “Museum Standard” track featuring wooden ties, metal tie plates, etched frogs and machined points. 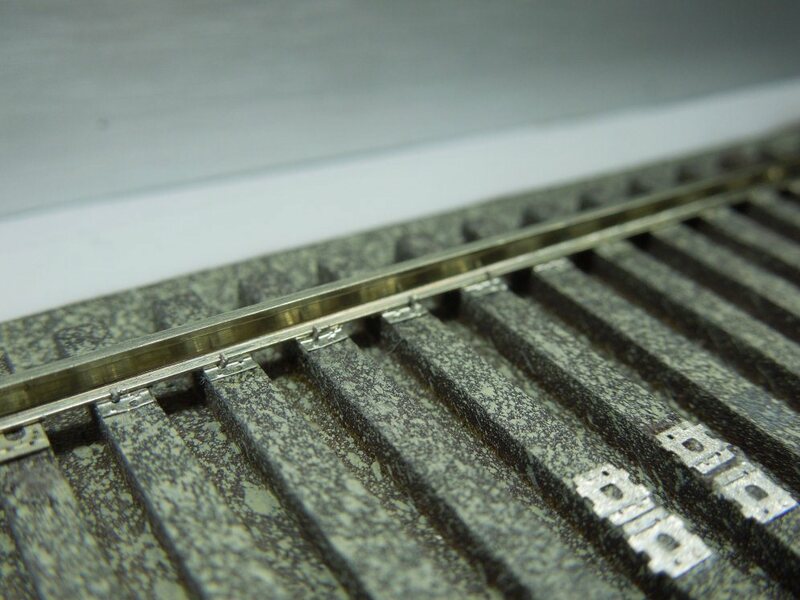 Turnout Tie Plate Fret – Reprinted from Proto:87 Stores website. This video shows how to use the Switch-Works tie jig to layout ties for a #6 “Ultimate” turnout. 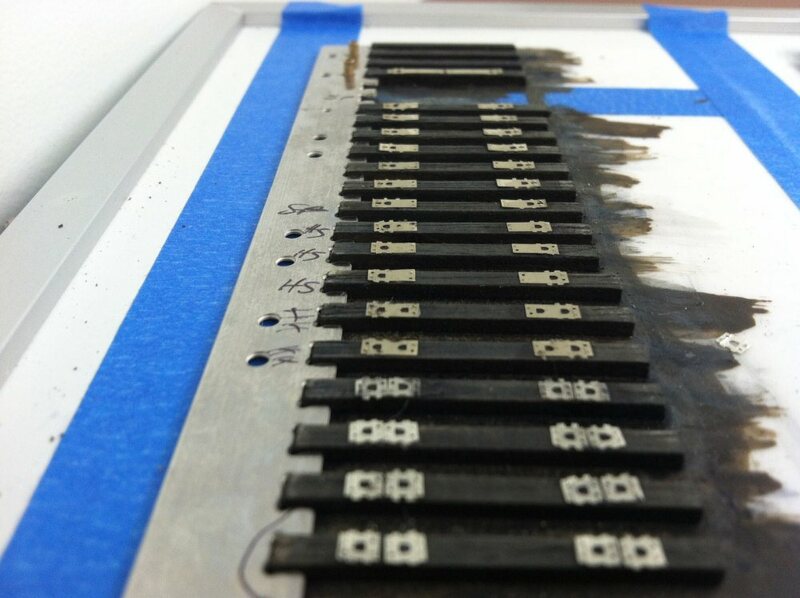 Switch-Works is a set of jigs for assembling “Museum Standard” track featuring wooden ties, metal tie plates, etched frogs and machined points. This video introduces what the Switch-Works System is and what you get with the “Ultimate” turnout kit. 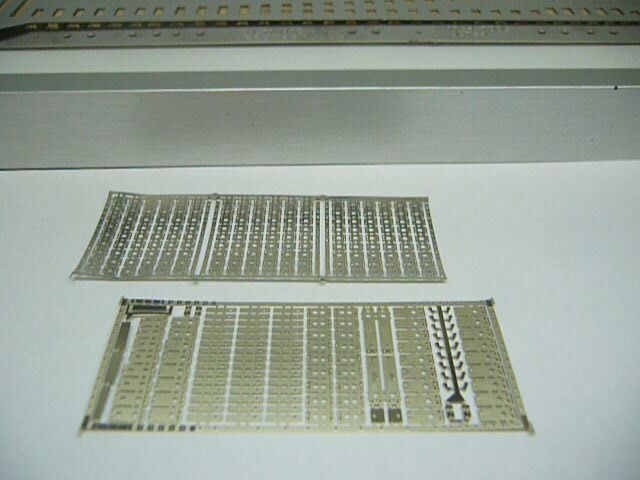 Switch-Works is a set of jigs for assembling “Museum Standard” track featuring wooden ties, metal tie plates, etched frogs and machined points. This video instructs how to assemble the Proto:87 Stores Switch-Works Pro Base. 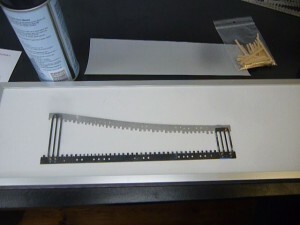 Switch-Works is a set of jigs for assembling “Museum Standard” track featuring wooden ties, metal tie plates, etched frogs and machined points. The Swith-Works Pro Base provides a flat and rigid magnetic clamping surface that is used to hold the track pieces you are working on. 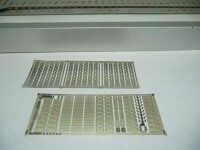 Additional asembly instructions available at http://www.proto87.com/building-switch-works.html. I’m using Proto:87 Stores Near HO Scale Spikes. These spikes are much smaller than even the Micro Engineering micro spikes with a head that is not so obtrusive. They are just short enough to not extend beyond the bottom of a full thickness tie, which makes it easy to spike the rails at the bench. And even though my track is actually glued down with barge cement, the spikes give a little extra hold and a big extra detail. 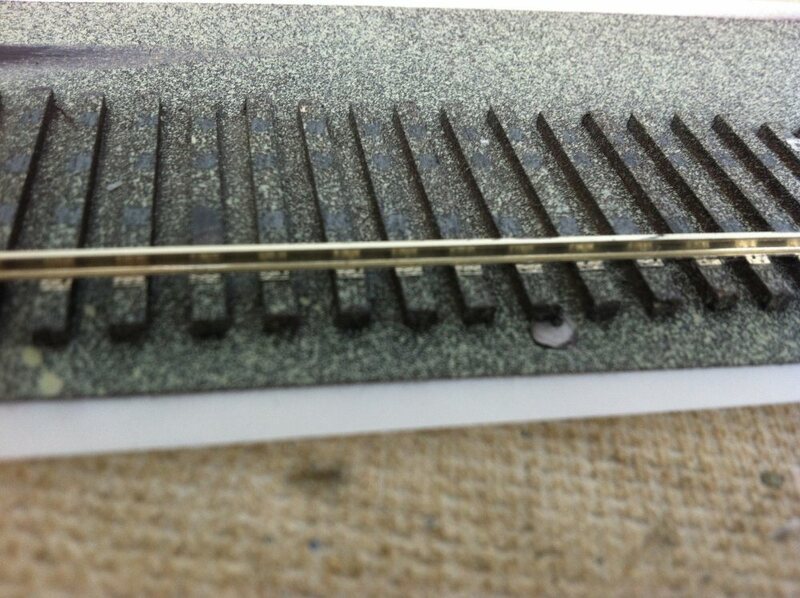 A standard fret has 250 spikes and I find it easiest to remove them from the fret as you spike each tie, as opposed to stripping the fret and picking the spikes from a pile. 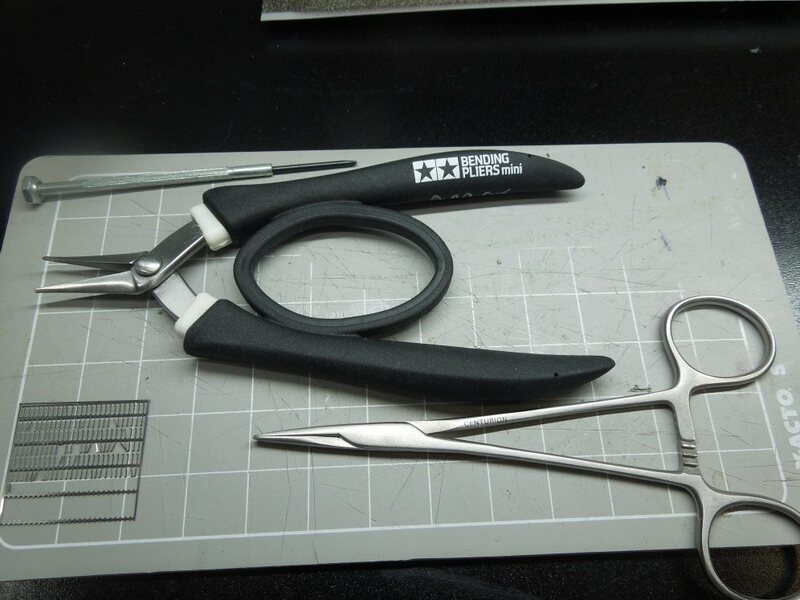 I use some Tamaya Mini Bending Pliers or some small forceps to start the spike into a tie plate, then usually drive it in with a small flat tip screw driver. The spikes are very rigid and do not bend easily. Proto:87 Stores lists them as stainless steel, but they are magnetic, so I’m not so sure. It’s pretty much essential to use an Optivisor or other magnification. 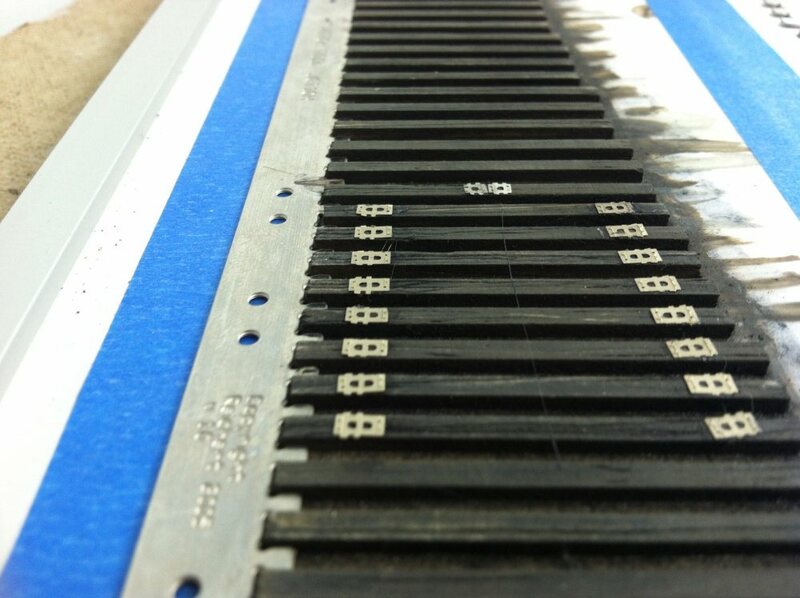 I spent about thirty minutes spiking one stock rail of a #10 turnout. I want to thank Andy Reichert of Proto:87 Stores for his generous offer to help sponsor the Switch-Works “Ultimate Turnout” Clinic. Andy is lending us a pair of Switch-Works turnout building fixtures and supplying us with kits to build ten “Ultimate” turnouts. 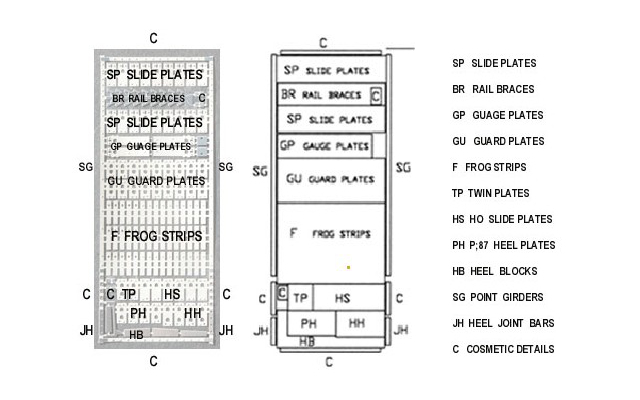 There will HO Scale kits in code 55,70,&83, with an assortment of frogs (bolted rail,rail bound manganese and self guarded). The clinic is 1 hour long. Registered attendees will have a chance to build a turnout. Since supplies are limited in addition to registering for the meet, please pre-register for this clinic by emailing me (greg@gregamer.com) to reserve a turnout for you to work on. 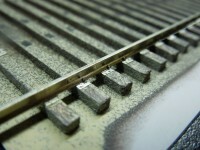 If you are building a turnout, bring some rail nippers, an HO track gauge, a file and a small pair of tweezers. Don’t worry if you’ve never built a turnout before, if you can glue things in to a template, you can build these great looking turnouts. I look forward to seeing you there. More about the Spring Meet. I have a couple of new techniques for putting together the Ultimate Turnout with the Switch-Works fixture. Glue the ties to the tie base using 3M #45 Spray Adhesive. I make a mask to keep it off of the tie jig, but if I do get overspray it cleans easily with mineral spirits. Preciously I was using a Barge Cement/MEK mixture, but it’s slow because you need to lay out ties first then brush the Barge/MEK mixture on tie by tie. 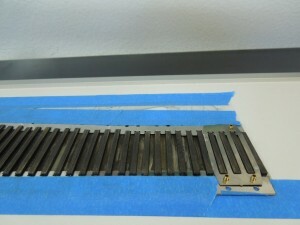 of the new method is it allows more work positioning the tie plates than using CA glue. 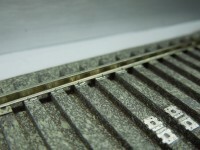 Glue the special tie plates, the close together tie plates and the very end tie plates using the Switch-Works jig. 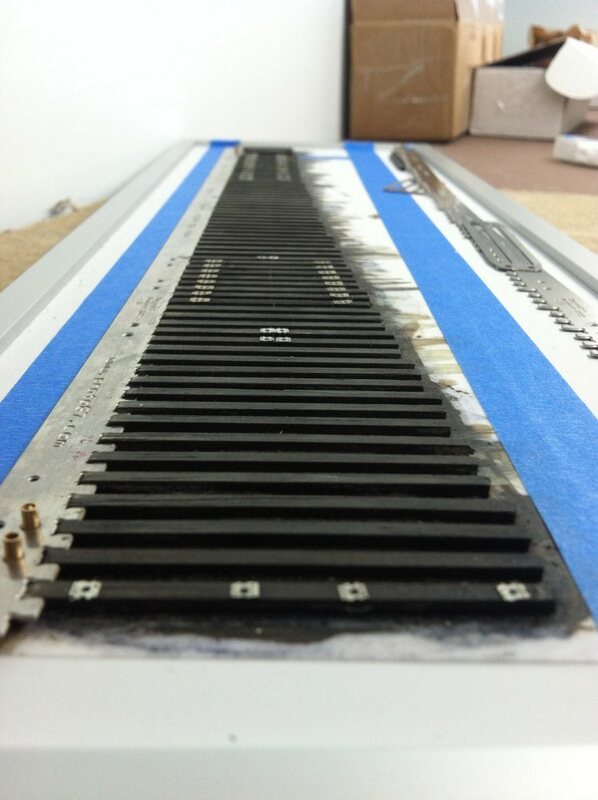 Install the rail and fill in the remaining tie plates by slipping it under the rail. 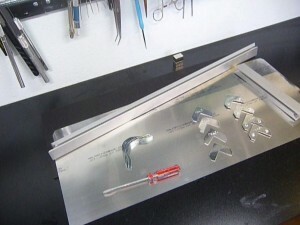 This allows me to use the Heavy Duty tie plates (which don’t fit in the jig) and is faster. The trick is to apply Barge/MEK mixture to the bare ties and the bottom of the rail; it generally has enough tack to press the tie plates in place; I drizzle MEK across all the joints when finsihed to clean and reactivate the Barge. The new techniques seem to provide a stronger bond and a cleaner look. I intend to make a video to better illustrate the techniques. 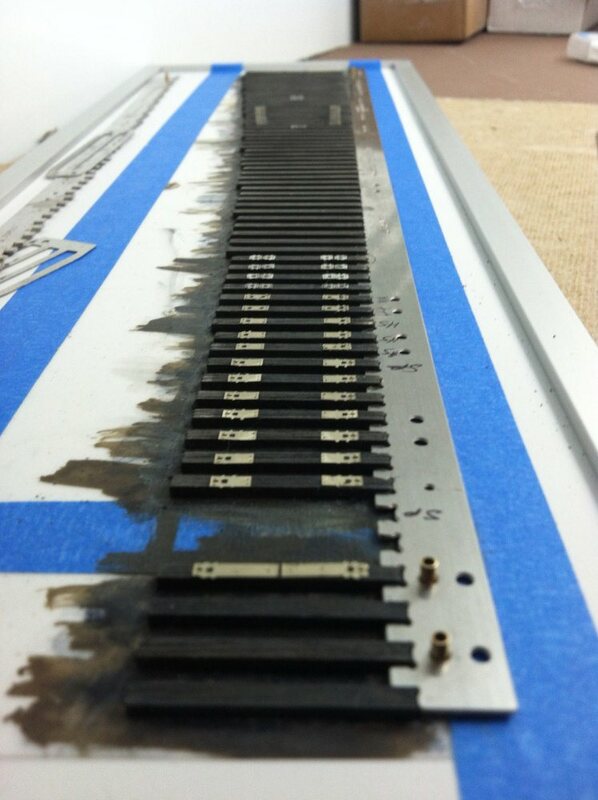 For now, here are a few photos of in-progress turnouts using these techniques. My first attempt at getting a realistic looking railroad ties. I distressed the ties with an exacto knife, wire brush and sand paper. 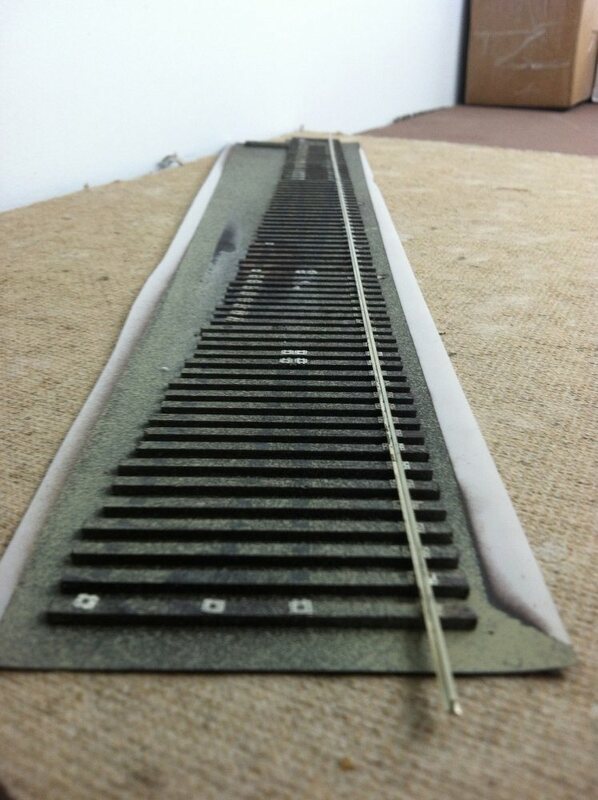 Weathering is various washes of PolyScale Railroad Tie Brown, Acrylic Raw Umber, Black Ink & Alcohol. I think it turned out a little dark,, I sanded some of the finish off after these photos and it looks a little closer to what I want. I’ve posted a couple of prototype photos as well as my weathered ties. I stuck with Acrylic and alcohol solutions instead of wax based solution because I don’t think the tie plates will adhere to a waxy surface.